Rays, Blue Jays, Tigers and Orioles, Pirates, Royals are all combo'd together. Featuring the top MLB veterans, rookies, prospects and MLB Draft picks, 2015 Bowman's Best Baseball will showcase base, insert and autographed content highlighting the biggest newsmakers of the season! Complete your 2015 trading card collection with this exciting RETURNING Bowman release! Bowman's Best Baseball will hit hobby stores in December '15. 2015 Bowman's Best Baseball includes insert content that will both pay tribute to the brand's origins and captivate new collectors! Putting a modern spin on the iconic 1955 Bowman television-set design in celebration of its 60th anniversary. - Atomic Refractor: 1 per case! Rare! 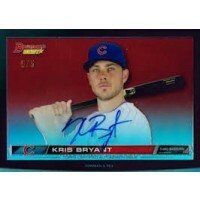 - Look for specially inserted ON-CARD autograph parallels!. Inspired by the 1995 Bowman's Best Mirror Image insert set, featuring thematically paired player combinations. Showcasing 1st Round picks from the 2015 MLB Draft on chrome technology. - Atomic Refractor: sequentially numbered. 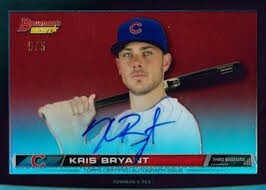 - SuperFractor Autograph Parallel: numbered 1/1. 2015 Bowman's Best Baseball will contain FOUR autograph cards per master box! With a checklist including the year's biggest veterans, rookies and prospects, Bowman's Best is sure to provide a compelling and diverse break. Featuring the top MLB veterans, rookies and prospects of 2015 on chrome technology. Featuring both on-card and sticker autographs on a recreation of the 1995 Bowman's Best base card design. The 2015 Bowman's Best Baseball base set will feature the year's biggest veterans, rookies and prospects on chrome technology. - Atomic Refractor Parallel: 1 per master box.